Campus tours are given from time to time on request. 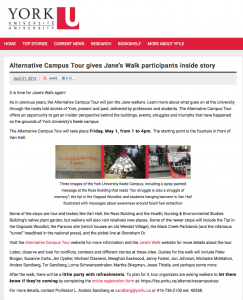 They are also part of the annual Jane’s Walks in the beginning of May. Poster of Alternative Campus Tour held on April 20 and May 5, 2013. 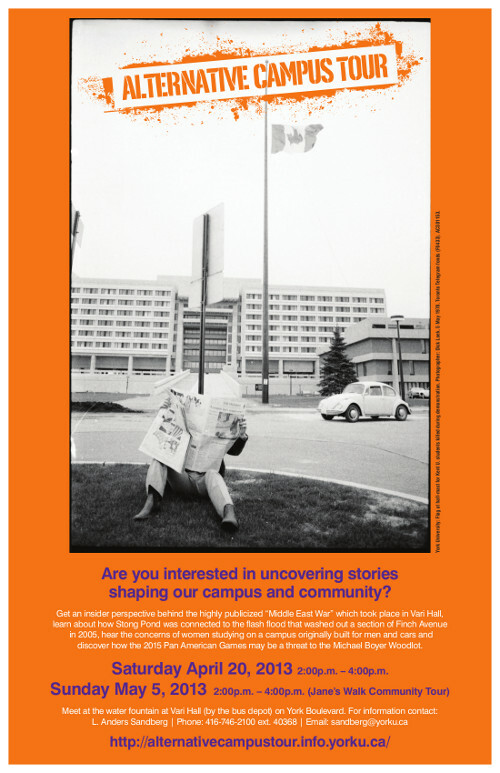 Text on poster: Get an insider perspective behind the highly publicized “Middle East War” which took place in Vari Hall, learn about how Stong Pond was connected to the flash flood that washed out a section of Finch Avenue in 2005, hear the concerns of women studying on a campus originally built for men and cars and discover how the 2015 Pan American Games may be a threat to the Michael Boyer Woodlot.